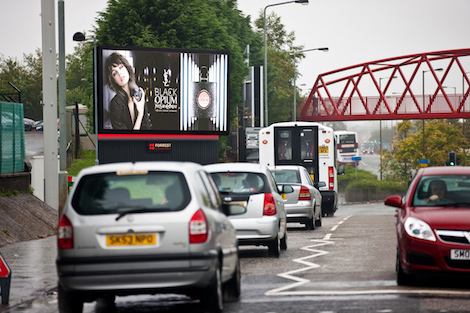 It looks like Forrest Media has begun a significant development strategy which will see the company strengthen its position at the top of the premium outdoor advertising market in Scotland. Forrest CEO Chris Trainer told us “We have embarked on a GBP 3m plus expansion programme, developing a brand new Digital 48 sheet network of sites in major towns and cities right across the United Kingdom. Phase One will see 12 new Digital 48 developments, ready for April, across Renfrewshire, Glasgow, Lanarkshire, Edinburgh, and Aberdeen, with further phases planned”. Over the last 15 years Forrest Media have carefully developed a giant, premium format digital ‘CityScreen’ portfolio and they are now “enhancing our offering with the introduction of these excellent D48 locations”. The distinctive Forrest brand is recognised across Scotland’s major cities and highly visible on most arterial and main road locations. We are told that they will deliver above average industry Route scores and the standard of build, quality of screen, and overall site presentation will reflect the quality for which Forrest are renowned. This entry was posted on Monday, January 29th, 2018 at 15:48 @700 and is filed under DailyDOOH Update. You can follow any responses to this entry through the RSS 2.0 feed. You can leave a response, or trackback from your own site.